Embroidered hipil, one of the many gorgeous textile creations at the Sunday Fiesta. 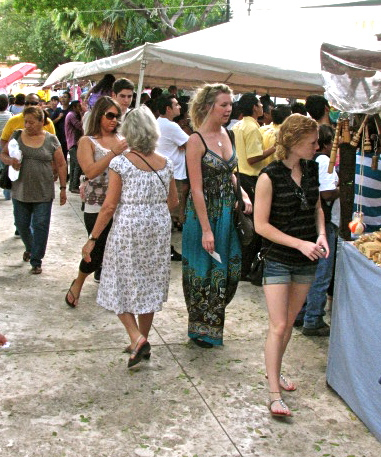 Every Sunday, Mérida throws a giant fiesta in and around its Plaza Grande. Music, food, indigenous dance performances, street artists, and the innumerable craft booths can keep you entertained all day and well into the night. 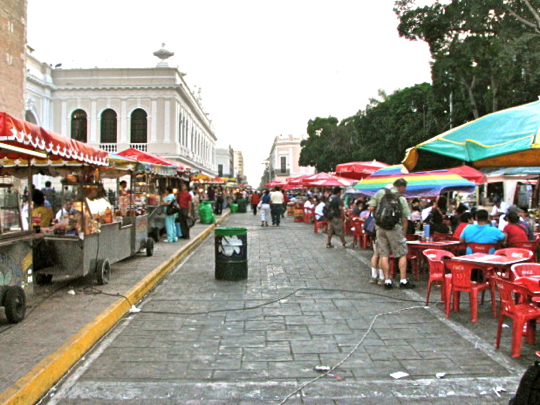 The city also shuts down several blocks of Calle 62, heading north from the Plaza, and several other streets in the area, to creat pedestrian-only zones. Local restaurants set up their tables and chairs right in the street. Every block or so you will find a band or other musical group providing free entertainment. Anyone planning to visit Mérida should include a Sunday, if at all possible. A grandmother, her daughter, and grand-daughter browse the booths. The abuela (grandmother) wears the traditional indigenous dress called a terno de gala. We saw women wearing them all over the city. At first I thought they were "dress-up" clothes for Sunday, or perhaps something to be worn for the tourist's sake. Soon, we discovered that this dress is the day-to-day outfit of a very large number of women here. Even women sitting on a dusty curb selling fruit out of rickety wooden boxes wore these dresses. How they kept them so sparkling clean was a mystery to us. 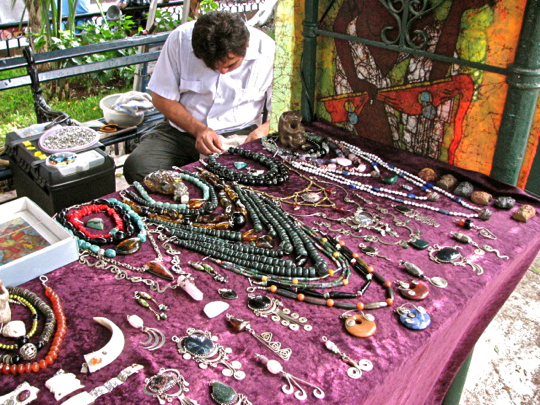 A jeweler works on a new creation while he displays his wares. Some of the pieces were stunning. Much of this jewelry is quite similar to what is displayed in the local archaeology museum. Maya craftsmanship has continued down through the generations for thousands of years. 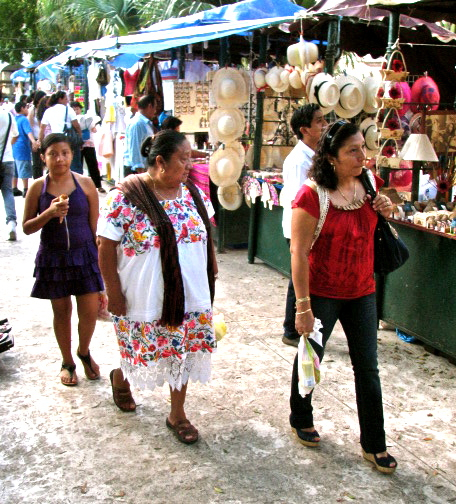 Although some of these wares were a bit on the expensive side in Mexican terms, a foreign tourist might find them a bargain compared to prices at home. Typical textile booth. 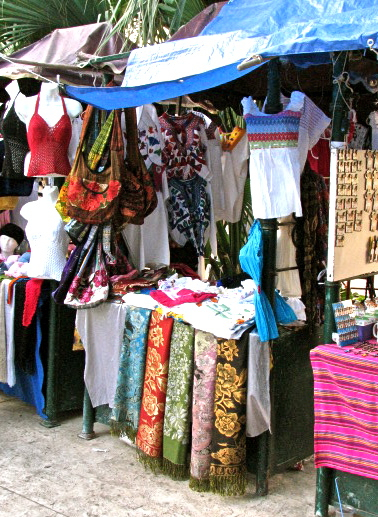 Here you could buy embroidered bags, rebozos (shawls), blouses, table cloths, and many other items, all hand-made. There were two concentric pathways around the Plaza each lined on both sides with booths. In fact, there were so many that I kept losing track of where I found items I might like to buy. It's a good idea to make a full circuit of all the booths before you make any purchases, because you may find something nicer and/or cheaper a bit further on. I finally resorted to writing down the location of the booths I wanted to revisit, otherwise I'd go nuts trying to remember where they were. We encountered quite a number of foreign shoppers. The two girls on the right were probably German or Dutch from their speech. We encountered a large number of Europeans in Mérida, and a fair number of Canadians, but very few people from the United States. I guess all the negative propaganda has frightened many of my compatriots into staying home, or at least out of Mexico. Even when they come, they tend to congregate in Cancun or one of the other "tourist bubbles" that are to Mexico as Disneyland is to real life. Too bad, they don't have any idea what they are missing. I periodically get comments on my blog from Americans who tell me they would love to visit the places I show, but are afraid to venture south of the border. They tell me they have resigned themselves to experiencing Mexico vicariously through my blog. This is flattering to me, but it ain't the same as being here, folks! Belts, belts, and more belts. The vivid and wildly contrasting colors you find in Mexico's textiles, and its art work in general, might seem a bit jolting if encountered in the US or Canada. Taken out of context, they can be somewhat eyepopping. However, when you live here, or visit extensively, you begin to realize that these are the colors that appear naturally, all around you. Particularly in the temperate or tropical areas of Mexico, flowers and other plants are constantly blossoming, with different species bursting into color during different times of the year. In addition, where I live, bougainvillea blooms year round and you can find several different colors of flowers on the same plant. It was strange at first, but all this seems quite natural now. 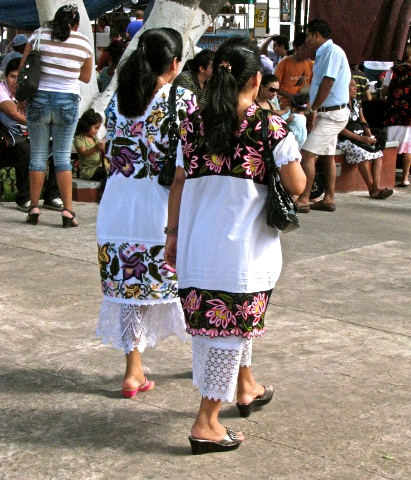 Two Maya women stroll among the booths. The overall design of their ternos de galas is the same, but the details of the embroidery differ significantly. The painstaking work of embroidery takes about 6 months for a single dress, and each is an individual masterpiece. When the Spanish arrived in the 16th Century, they found a Maya civilizations with highly developed crafts produced by skilled artisans. One of these crafts was the weaving of cotton blankets, often beautifully decorated with feathers. Following the lead of the native lords, the Spanish demanded these blankets as part of the tribute they collected from towns and cities they conquered. Over time, Franciscan friars taught the indigenous weavers Spanish techniques and one eventual result was the terno de gala. An especially beautiful example of a terno de gala. The garment gets its name "terno" from the fact that there are three parts to it. According to the Mérida Tourism Department, "the first one, known as the 'jubon' is a wide, flat, richly embroidered square flounce that is attached to the neckline of the second piece, the hipil. The latter is a white knee-high square dress, with embroideries and a lace-trimmed hemline. The third part, called 'fustan', is a long, straight waist-slip, which is worn under the hipil and is also embroidered and lace trimmed. All the embroideries are done using a technique known as cross-stitch." 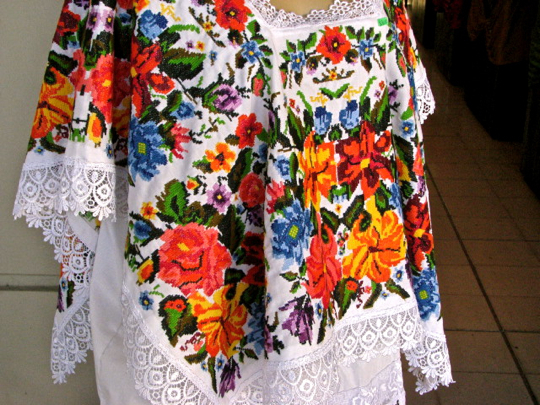 Often the terno will be complemented by a rebozo called "Santa Maria", referring to the village where they are made. The wearer matches the rebozo color to complement the terno. A closeup of the beautiful embroidery. 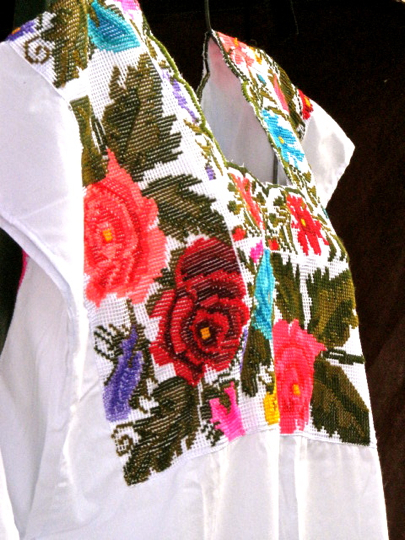 Embroidery in Yucantan goes far back into the pre-hispanic era. Some pieces have even been discovered at the bottom of Chichen Itza's sacred sacrificial cenote (well). The ancients used a stitching technique called chuy cab, or satin-stitch. 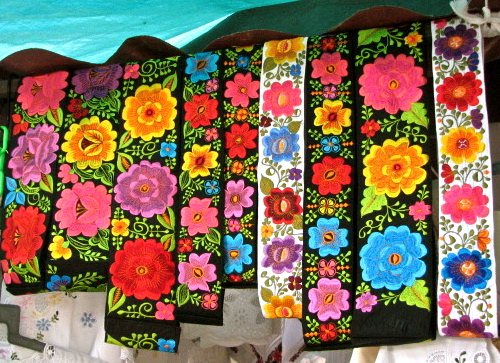 This method is still used, along with the xocbil chuy, or cross-stitch, and another called xmanikte. There are many other stitching techniques used in addition to these, and they are passed down from mother to daughter. Having a booming good time. This rather jolly-looking fellow thoroughly enjoyed having his photo taken. His female companion seems a bit more skeptical. 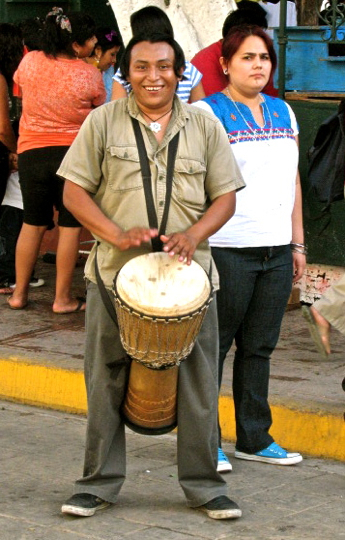 He was part of a Maya drum circle that set up shop in the middle of an empty but normally traffic-clogged street. I love having a live "sound-track" to my life, so I nearly always contribute to street musicians. They work hard for their money and usually give good performances. This particular group played hand-made drums not unlike those used by their pre-hispanic ancestors. And for those that get hungry... Calle 60, along the east side of the Plaza, was lined on both sides with food booths. Inexpensive and delicious traditional Mexican food can be obtained here, if you want a break from the more spendy formal restaurants. Such street food is usually safe to eat, especially when it is cooked. Of course, it is always possible to pick up a bug, but you're not in Kansas anymore, are you? Still, even in Kansas, people occasionally get sick from restaurant food. 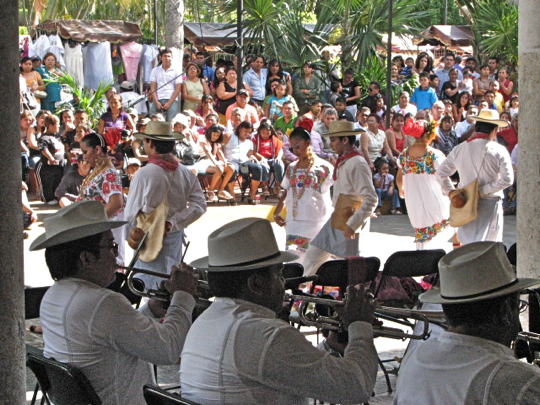 A local orchestra belts out a tune for a troupe of jarana dancers. Jarana in Spanish means "racket" or "noisy party". 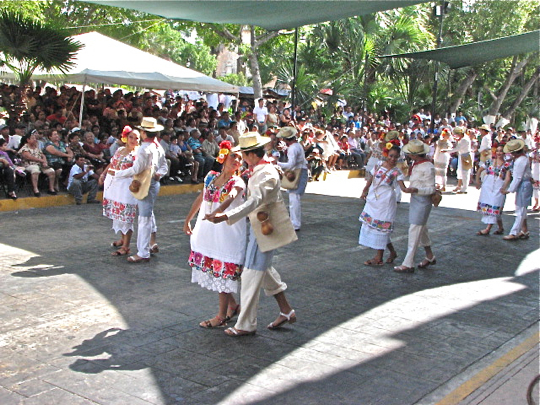 However, in Yucatan it refers to a local dance that is rooted in both European and Maya traditions. Generally, a jarana orchestra, called a changara will have 2 clarinets, 2 trumpets, 2 trombones, a "güiro" or dry gourd with slits tapped with a stick, and a set of tropical kettledrums called timbales. Everyone, musician or dancer, is dressed in an immaculate white outfit with touches of color from kerchiefs or embroidery. The music is very upbeat and much more harmonious than the jarana name implies. The Sunday Fiesta performances always draw a big crowd and it was a bit difficult to find a spot to get good photos, so I had to be creative. 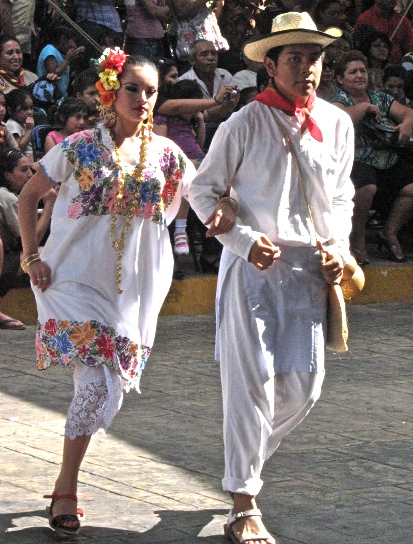 Jarana dancers are paired off into couples dressed in traditional clothing. While many of the women still wear these dresses on a daily basis, the men have mostly adopted more modern clothes for daily wear. Notice that the men all have their right pant-leg rolled up almost to the knee. I'm not sure, but this might have something to do with making the dance steps easier. 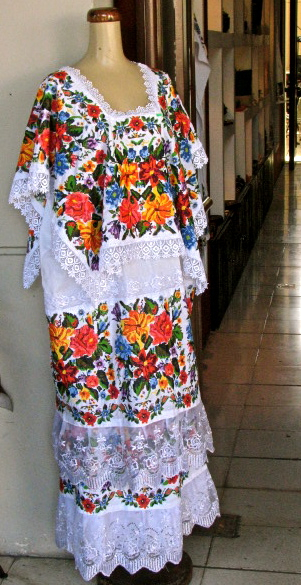 Traditional clothing like this is known as traje de mestizo. The dancers have to be athletic because their performances may be quite lengthy. It is not only the dancers who must possess stamina. Most of the instruments in the changara come in pairs. If a musician becomes tired, his partner can keep going. These dancers regularly perform for the big Sunday Fiesta and sometimes on Thursday evenings. 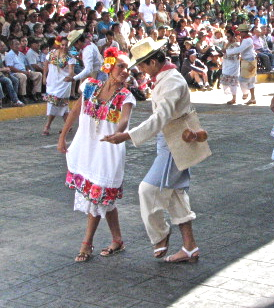 However, many local people perform the jarana during fiestas related to their villages' patron saints' days. Steppin' out. The dance steps are vigorous and intricate and vary from dance to dance. The performers whirled about, sometimes face-to-face, sometimes side-by-side. If a couple is particularly outstanding, the other troupe members may form a circle around them as they dance to the sound of the timbales. There are two kinds of jarana, one to a 6/8 beat and the other to 3/4. The 6/8 jarana resembles a tap dance called a zapateado. This has its origins both in ancient Spanish Andalusia and in the local mestizo music called sones. The 3/4 jarana was developed later and more resembles a waltz originating from the folk tunes of Spanish Aragon. In Mexico, this cultural blending is called sincretismo. And then, there's always the Purple Angel of Death. Mimes in outrageous costumes are very popular in Mexico. 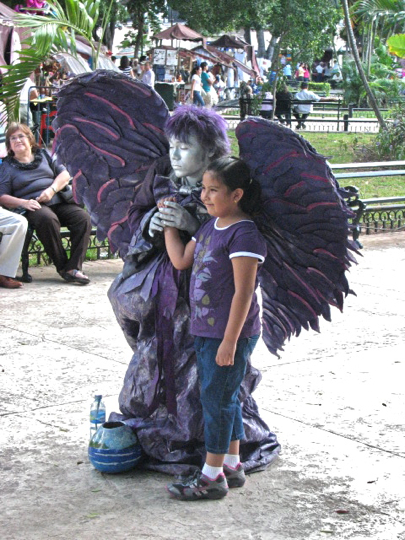 This angel of death didn't seem very scary to the little girl, whose parents wanted to take her photo with the apparition. I've seen motionless mimes in cowboy outfits painted gold from head to toe. In another case, I ran into a futuristic Special Forces trooper who could trigger a mechanical sound effect so that every move seemed like it was by a mechanical robot. Quite an imaginative bunch, these Mexicans. This completes Part 3 of my Mérida series. Next week we'll visit the great flocks of Pink Flamingos that congregate at the Celestún Lagoon on the Gulf Coast of Yucatan and, afterwards, take a boat ride through the thick mangrove swamps full of alligators and other creatures. I always encourage comments and/or corrections. If you'd like to do so, please use the Comments section below, or email me directly. If you leave a question in the Comments section, PLEASE leave your email address so I can respond. You're so right about tourists visiting "the bubbles" not seeing the real Mexico. I've been living here for almost a year, and the day-to-day reality is so much more interesting than the fabricated "Disney" experience. Thanks for documenting the real Mexico. NW Yucatan Part 1: Mérida, the "White City"